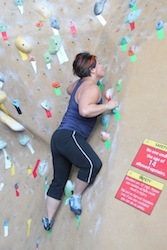 Last year, when Nick and I went to Las Vegas, we had the absolute thrill of going outdoor rock climbing with our friend, and one of the most awesome tour guides (over at Grand Adventures in Las Vegas) ever, Erik. It was AWESOME. 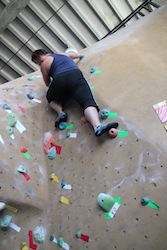 I had never done any kind of climbing before that (well, except for climbing trees). 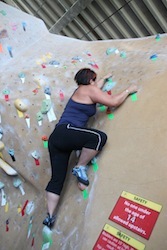 I had such a great time, in fact, that I went and bought my own pair of climbing shoes after our adventure. I never even got a chance to use them afterward though! 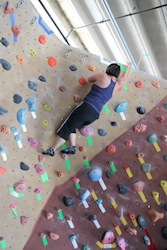 Well we have several friends that enjoy outdoor and indoor climbing, and like I said before, Ryan and Nick have gone bouldering at Planet Granite a few times (I even did a little photo shoot of Ryan the first time they went). 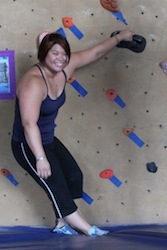 Well today I decided it was time for me finally break in my climbing shoes, and to jump on the wall, as well! 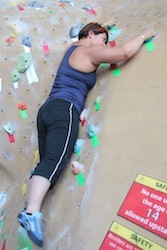 With bouldering, you don’t use a top rope while climbing, so there are large “crash pads” on the floor to help soften the blow if and when you fall (or jump) from the wall. 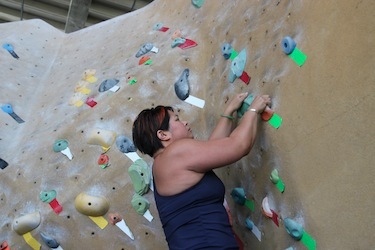 While I really enjoyed outdoor rock climbing with a top rope, the thought of jumping off a real rock onto a crash pad below sounds so scary! 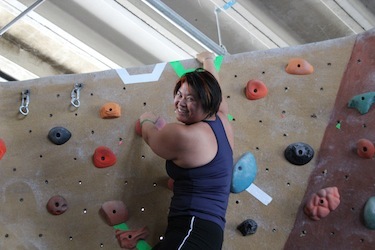 I was glad to start my bouldering experience indoors. 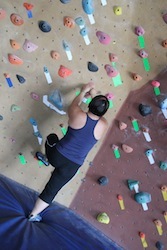 There are routes marked with different colors of tape, and ratings for the difficulty of each route. 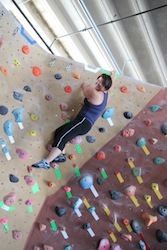 I hopped up on my first wall – it was okay, but it still gets kinda scary as you get to the top! Yay! I made it! Whew! There were some pretty funny grips in the walls, like this telephone receiver. Hello? Is that for me? 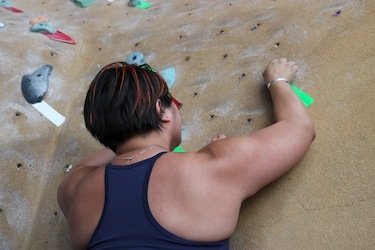 I had fun bouldering for the first time. 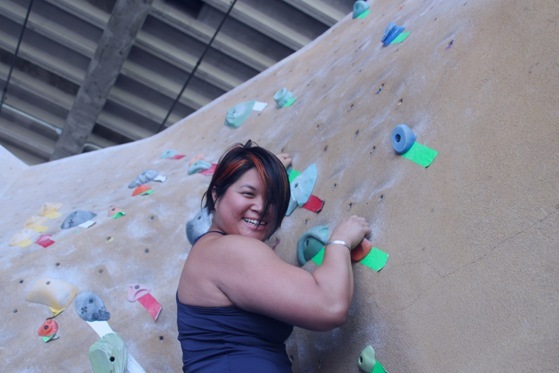 It’s like a big playground or jungle gym for grown-ups (kids can use some of the walls, too, but there are some areas that are supposed to be “14+ only”). 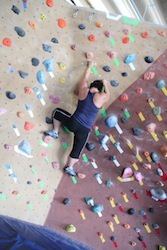 It’s neat seeing people staring at the wall, trying to figure out what route to take to get up. 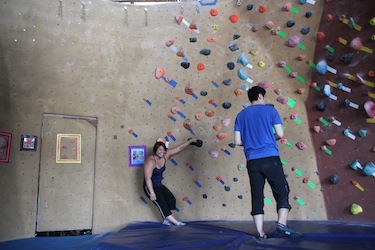 There are a lot more challenging routes, and like I said in the previous post about bouldering, there’s even a ramp to the second floor, with a bouldering wall hanging above it (for the daring and experienced only!)! I’ll be back. 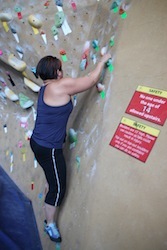 Next time, I’ll “top out,” too!